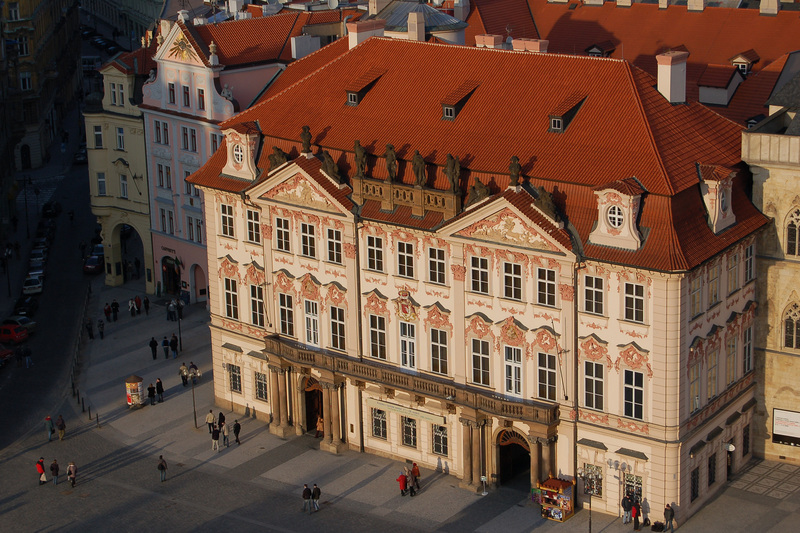 This Rococo building on Old Town Square features rich stucco and sculptural decoration. The Kinský Palace has been witness to many historical events. 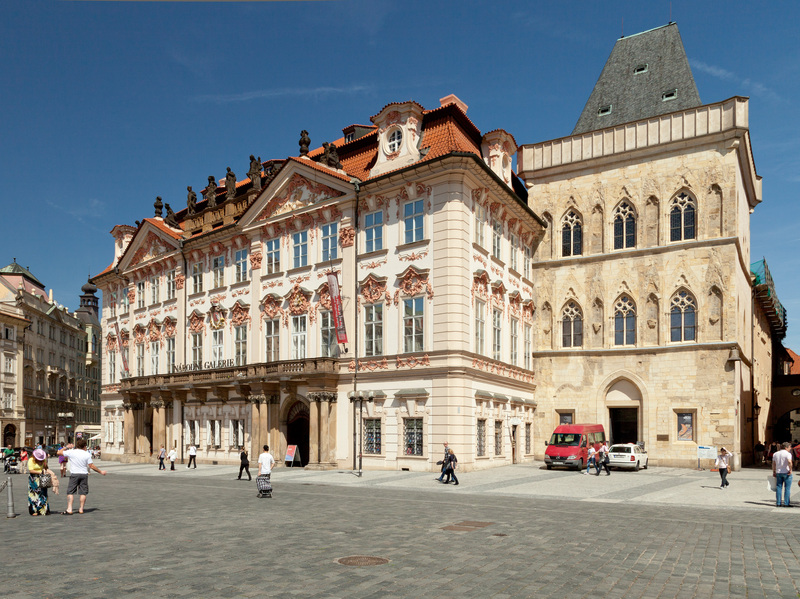 Today it is the seat of the National Gallery in Prague. The National Gallery in Prague opens its permanent exhibitions for children and youth under 18 and students under 26 years of age completely for free. For temporary exhibitions the usual admission fee applies. The Rococo building was designed by the project of Anselm Lurago or K. I. Dientzenhofer (controversy over the authorship) from 1755 to 1765 for Jan Arnošt Golz. Originally, at the site there were originally At the Old Currency House (U staré měny) and Muglicerovský (U Stolice Královské) House. In 1768 (after the death of Count Goltz) František Oldřich Count Kinský bought the Palace. The palace remained in the possession of his family until the year 1945. In 1836 Rudolf Prince Kinský started the reconstruction of the entire residence by the builder, Jindřich Koch. U Pechanů house was added to the building and the interiors were modified in the spirit of Empire Classicism. The main facade is divided by the two buttresses topped with triangular peaks, among them plastics stands designed by Ignác František Platzer (Elements allegory and ancient deities). In May 1945, plastics were damaged, and so they were replaced with copies in 1956. Stucco panels of the gables were made according to the projects of Platzer probably by Santin G. Bussi (mythological themes such as the abduction of Europe, etc.). He is also the author of the reliefs above the windows (Madonna and Child and St. Jan Nepomucký). In 1843, Berta Stuttnerová-Kinská was born in the palace; she was the first Peace Nobel Prize winner. The German gymnasium, which was located on the second floor, was attended by young Franz Kafka in 1893-1901. On the ground floor his father, Hermann Kafka, had a haberdashery shop from 1912 until his death. By 1929 Polish Embassy was here. On 25 February 1948 Klement Gottwald gave a speech from the balcony and so began another era of the lack of freedom for our peoples. In 1995 - 2000 the reconstruction of the palace took place. The Kinských library was reconstructed and precious and highly protected Romanesque and Gothic cellars were opened to the public. In the premises of the palace after the reconstruction the Kafka bookstore was reopened. The Information centre of the National Gallery was established here and museum shop were opened here; the National Gallery also has offices at the back wing of the building. In the front wing there is a space for exhibitions. Kinský Palace is a national cultural monument.